I’ve only had two major (i.e. not cross-town) moves in my life, and both times, my saving grace was boxes that were 1) color-coded, 2) numbered, and 3) prioritized, with 4) their contents carefully documented. Is this necessary? No. But was I happier for it? Oh gosh, yes. My carefully color-coded, numbered, prioritized, documented boxes were my safe place when I was otherwise surrounded by chaos. Okay! So to achieve packing bliss (or at least as close to bliss as one can experience while moving), you need two things. First, get a few packs those colored price tag stickers found in any office supply section, like these or these. Ideally, you want as many different colors as you have rooms in your home, so you might have to buy two different packs. The other thing you need is either a notebook or Excel. I used both, but I’m weird. 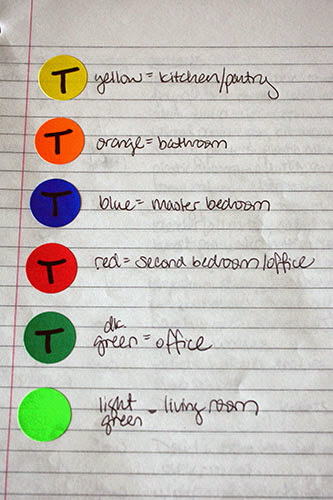 With your stickers, assign each color to a room. The idea here is that when you’re packing, you place the appropriate colored sticker onto each box to designate where you and your moving-helpers should place the box while you’re moving in. Sure, you could scrawl the contents on the outside of the box – but colors are easier than reading, and you can even put a sticker on the doorframe to guide your movers. Here’s the key I made for our move (because I’m forgetful). I also wrote “T” on them because.... well, I really don’t know why I wrote a “T” in particular. I think it stands for test? 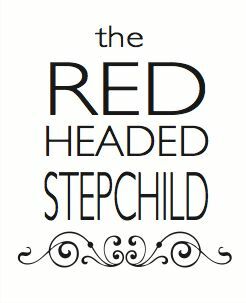 The reason I wrote anything, though, was to make sure black ink would stand out against the color. That dot is where you write a number that’s unique to that box and no other box. And with that number, you can make a code for your master packing list! 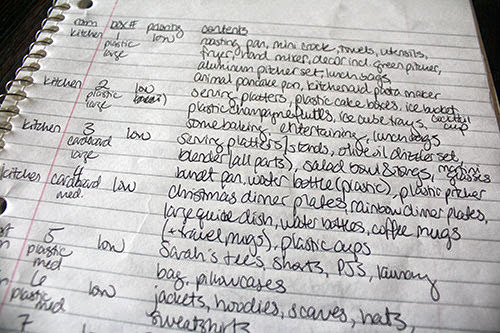 I started out handwriting my master packing list in a notebook that I could carry around while I packed, but I ended up coding it into Excel later so that I could have an easily searchable file. 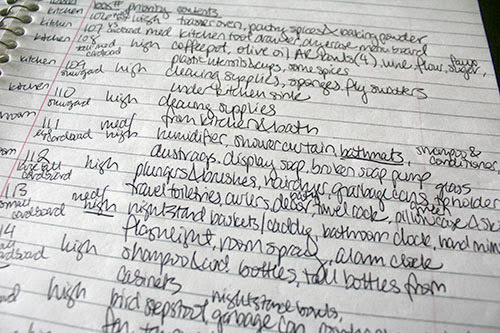 Excel isn’t entirely necessary, though, because with only a few handwritten pages (probably less than ten) it’s easy enough to scan the pages for the item you want to find. Either way, you’ll notice I wrote a ton of information about each box: the room, the contents, the sort of box it was (so I could easily spot it in a stack of boxes, if the number didn’t jump out at me), and another very important rubric: the PRIORITY. Priority is what ensures that you don’t open a box full of textbooks or fine dining linens when you really, really need to locate your TOILET PAPER. Or TOWELS, or FORKS. Or any of the other super-important things you need when you first land in your new place. I assigned priority as follows: “high” is anything we’d need within the first few days, “medium” is what we’d want within the first few weeks, and “low” is anything that could sit in a box indefinitely until I wanted it. It’s important to be stingy about assigning anything but low priority, because you can only unpack so many boxes at the beginning. For instance, we moved in June, so I labeled all our warm-weather clothes as “medium”, but our other clothes were “low”. Honestly, I think assigning priority is the secret to keeping your sanity in your new place – just as important, if not more important, than documenting the contents within. I actually wrote “H”, “M” or “L” under the number on the sticker, so I’d know if I needed to unpack it even without checking what’s inside. That makes unpacking order obvious! And fortunately, the reverse is true also. Priority sort of makes itself obvious as you pack – you’re likely packing up the least needed items first, like in the list above. The higher priority stuff naturally gets packed toward the end. It’s possible, if you follow this method, that your moving-helpers will look at your packing handiwork and pronounce you absolutely crazy. I know this is possible because that is exactly what our friend said to me. 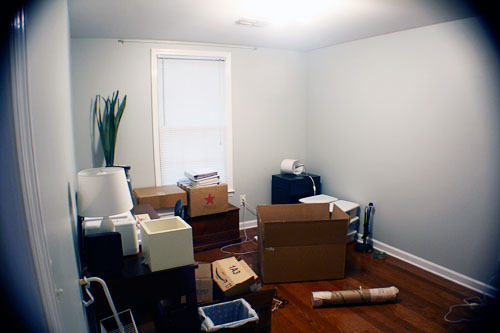 Of course, you don’t have to pack everything this way, especially if you’re relocating across town, or in phases, or in an otherwise less stressful way. But if the chaos of moving intimidates you as much as it does to me, this method will help you create order within chaos, and hopefully retain your sanity! Thanks! This is really helpful. I've already packed the L boxes and I'm feeling relatively organized given the chaos of our apartment right now. Your blog is going to be a huge help now that we're home owners! Congratulations, Jenni! Happy Home-of-your-own making to you and Matt!